Senior art major Christa Cape is one of four students who received the 2016 Yeck College Artist Fellowship from the Dayton Art Institute. As part of this fellowship, Cape, along with three other college students, has spent the last nine weeks teaching and mentoring 14 high school art students. 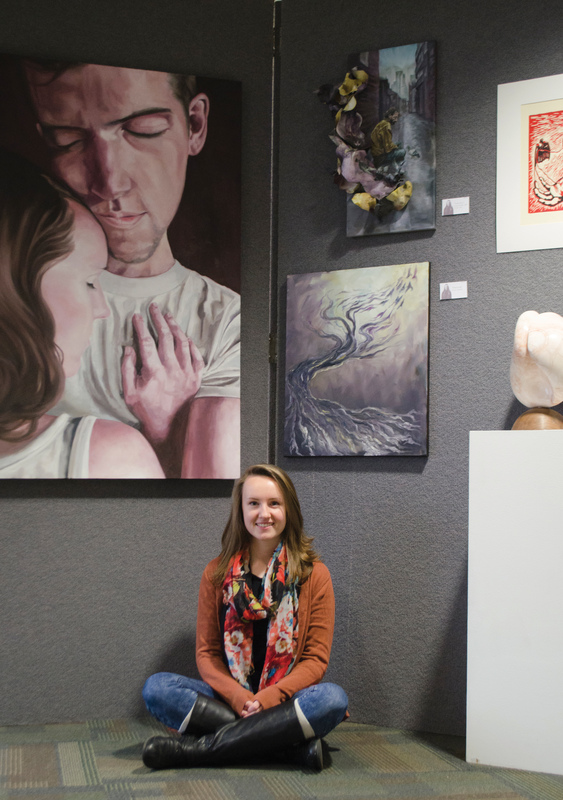 Christa Cape, a senior art major from New Hampshire, sits with her art in the Senior Showcase in the Upper SSC. Cape is one of four local college students who received the 2016 Yeck College Artist Fellowship from the Dayton Art Institute (photo: Jennifer Gammie). During her days of teaching, Cape said she wrote lesson plans and worked one-onone with students to aid them in the problem solving process and in creating their art. In addition to teaching, Cape was given a grant of $1,000 to produce artwork that will be featured at the Dayton Art Institute. Her theme, “Seasons,” specifically highlights the various seasons of life. Cape has created paintings revolving around the natural world and nature as a metaphor for the seasons of life. Cape said she drew her inspiration from her childhood in the woods of New Hampshire. She said she has always been drawn to nature and finds most of her inspiration in the constant change of life. Through her art, she said she explores the times of life, exposes themes of hope and encourages her audiences to savor the world around them. When creating a new piece of art, Cape said she always thinks about art as communication. “What do I have that is different that I want to share with people?” she said. In her art, she tries to connect the seasons in nature and the seasons of life with theology, Cape said. Cape will complete four pieces for the Dayton Art Institute as a Yeck College Artist Fellow. She said she had to plan out every piece before she started creating it, which was a new process for her. One main difference between Cape and the other fellowship recipients is Cape’s Christian background. Annie Lee-Zimerle, assistant professor of art and design at Cedarville, said Cape’s faith can be seen in all the work she creates. Cape said her favorite part of the fellowship has been getting to know the other artists, as the fellowship has been her first big interaction with secular artists. As she has studied at Cedarville, Cape said she strives to integrate her faith into everything she creates. She said this has given her a unique perspective when it comes to creating art for the fellowship. Cape’s art will be displayed at the Dayton Art Institute from May through September. Hannah Dunlap is freshman journalism major and arts & entertainment writer for Cedars. She has an affinity for photography, exploring and Netflix marathons. 1 Reply to "Student Spotlight – Christa Cape: Artist"
Great article, so cute girl.